Big, bold, and masculine, the pilot’s watch constitutes a watchmaking genre all its own. Big, bold, and masculine, the pilot’s watch constitutes a watchmaking genre all its own. 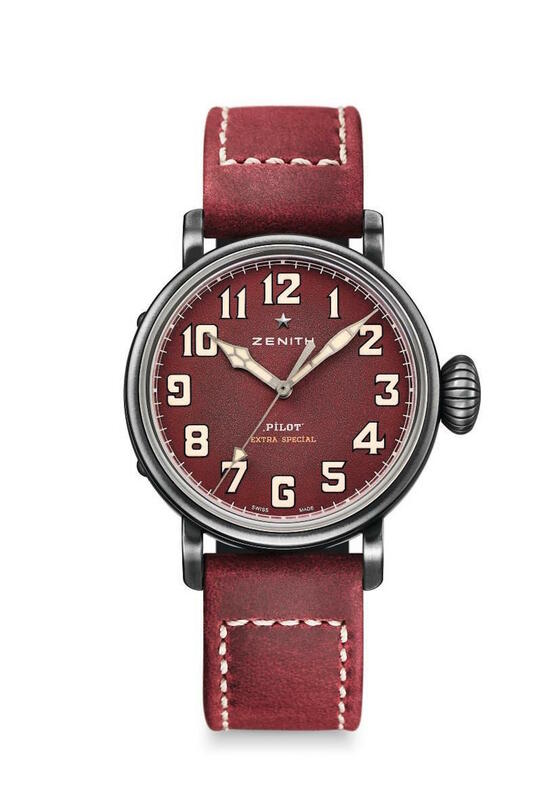 Traditionally produced on calf-leather straps that were wrapped around thighs or bulky gloves for easy reading during flight, the watch’s rugged style has been reborn in recent years as a staple of fine watchmaking thanks to modern interpretations—exemplified by Zenith’s new Pilot Extra Special 40 mm, unveiled in July—that are more refined but no less manly than their vintage counterparts. The Pilot model shown here comes in a 40 mm case fashioned from aged steel, which lends the timepiece a retro look enhanced by notable elements such as a broad fluted crown, oversize luminescent Arabic numerals, a grained finish dial, and an oily nubuck strap with contrasting stitching. The company’s historic logo, a coat of arms studded with stars and bearing the founding date of the Manufacture Zenith (1865), appears on the caseback. To balance out the vintage vibe, the Elite 679 caliber in-house self-winding movement and dusty burgundy color imbue the timepiece with an unmistakably contemporary flair.